In these buildings on the TU/e campus you can find a food outlet where you can at least have lunch between 11.30 and 14.00 hours. In Atlas on the 1st floor you find the University Club: the restaurant at the TU/e to meet, relax and hold a meeting in an informal atmosphere. A stylish but accessible place, with a surprising and yet recognisable menu. You can reach the University Club via phone number 040-247 5550 and universityclub@remove-this.tue.nl. 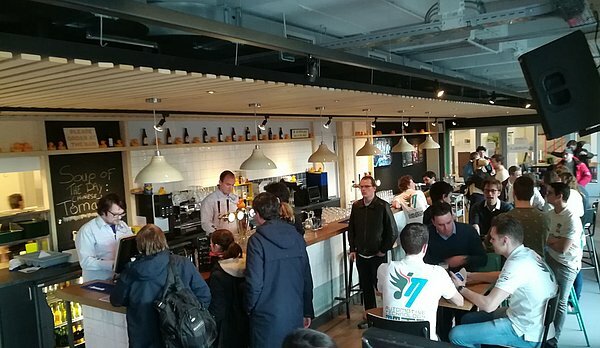 The film house and grand café De Zwarte Doos is the place for students and staff as well as visitors from outside TU/e to meet on the TU/e campus. Enjoy a bite and a drink in the grand café with its restaurant and terrace overlooking the river De Dommel. De Zwarte Doos is at the front of the Limbopad, next to the Vertigo building. The film house, which shows new films each week, is regularly the backdrop for lectures. There are three conference areas available for organizing various activities from debates to drinks. Also a small restaurant is located on the first floor. A daily fresh UC-menu is being served here, but you can also use the regular menu of the Zwarte Doos. You can make a reservation for this restaurant by sending an e-mail to cafedezwartedoos@remove-this.tue.nl. Hubble Community Café is a lively hotspot on campus, open seven days a week. Food & beverages for friendly prices in an informal setting. In summer, Hubble offers a sunny terrace with a view on the Dommel. During winter, the café offers a warm living room for its visitors. Hubble is by and for students and employees, but open to everyone. Our motto is “everything is possible, nothing is too crazy”. This is the perfect location for associations and departments to organize activities and drinks.